What card would make Mt. Olympus a multiple of ten? If I play a seven, what card will you play? Each player draws four cards, most of which have numbers on them. Players take turns placing a number on the discard pile, which is known as Mount Olympus. The number on the card is added to the Mount Olympus total. So if you play a 5, and then your kid plays a 7, Mount Olympus now has a value of 12. If you play a card that makes Mount Olympus equal a multiple of ten, such as 20, 30, 40 and so on, you get to steal the Zeus statue from its previous owner. 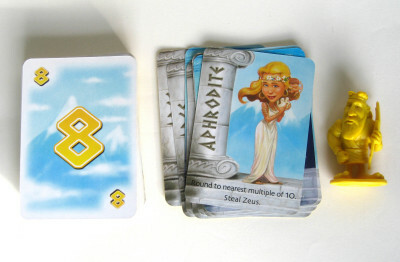 The player who is holding onto Zeus when Mount Olympus reaches 100, wins. At this point, it sounds like this game could be played with a normal deck of cards (and, in a pinch, it can). But not all the cards contain numbers. Some of the cards are designed after the Greek gods and goddesses, and each of these cards has a special power. Some, like Apollo, simply steal Zeus. Others, like Poseidon and Hermes, change the value of Mount Olympus. The riskiest and most exciting card is Hera, which allows you to steal Zeus and raise Mount Olympus to 99. If your opponent has a 1, he can steal Zeus and win. If not, he has to play a different number that allows you to cross 100 holding Zeus yourself. 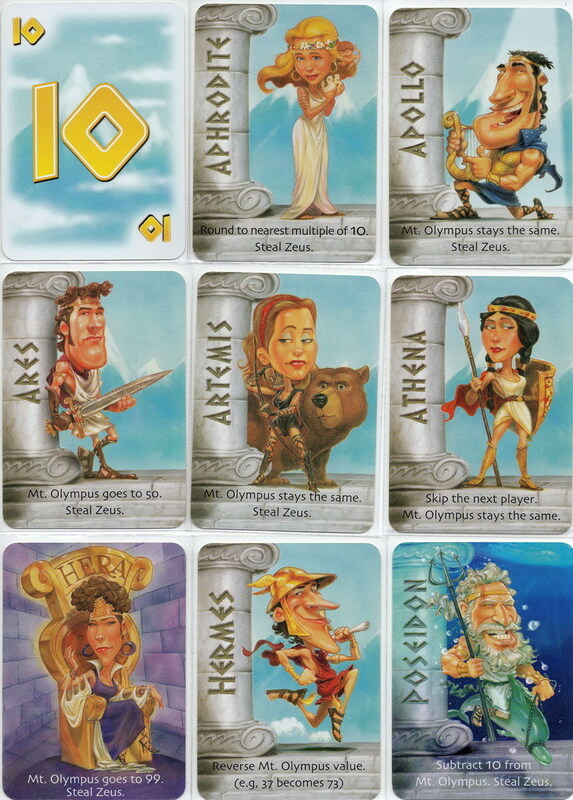 When I taught my son the game, I started by playing the cards face-up and only using a couple of the Greek god cards. As he got more comfortable, we added the other cards until we were playing with the whole deck. This is a great way to make the game accessible for kids who can't reliably read the game cards yet. As Katie told me, she wasn't terribly excited about the math at first. Kids definitely need to practice their addition facts, but she wasn't as enthusiastic about the game as her students were. But after playing along a few times, she started to see the way that the game helps kids think about addition in a very particular way. As she said "Kids loved stealing Zeus, especially because it was stealing. They felt like they were getting away with something." At first, most kids just waited around for the special Greek god cards that helped them steal Zeus from their friends. But over time, they started to think about the other way that they could steal Zeus, by adding to a multiple of ten. Katie would encourage this line of thinking, asking kids "What number could you play this round to steal Zeus?" Kids benefit from becoming fluent at addition, and particularly with the pairs of numbers that add to ten. Many addition strategies are based on making "friendly numbers," which are usually multiples of ten. For example, to add 58 + 37, I could add the digits traditionally, but another way might be faster for me. Maybe I borrow 2 from the 37 and add it to the 58, so the problem is now 60 + 35. Much easier to add, right? And definitely easier if I'm eight years old and I don't have any paper handy. Zeus on the Loose encourages kids to think about a two-digit number and figure out what number they could add to make it friendly. Sure, they're only doing that math so they can steal Zeus, but who cares? They're building a framework that they can use for the rest of their elementary careers. Heck, that's how I add numbers when I don't feel like reaching for paper (or, let's be honest, my phone). I already mentioned Katie's great question above, so in this section I'd like to share a wonderful moment she had with a student in her math club, and the math journey they went on together. As Katie told me, Jose was an incredibly energetic and squirrelly little kid, and he definitely wasn't seen as a "math kid." Despite this, he loved math club, especially Zeus on the Loose. 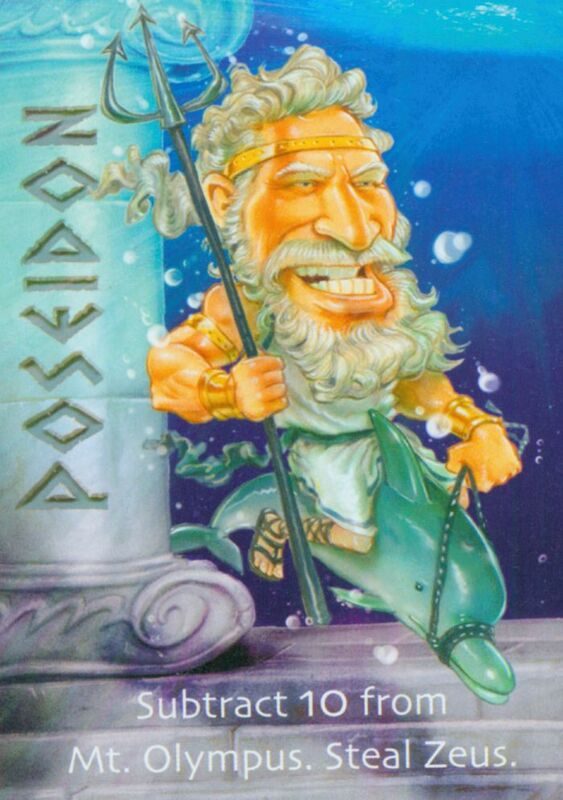 One day, Katie was starting a game with Jose, and he played Poseidon, which allowed him to steal Zeus and subtract 10 from Mount Olympus. The problem was, Mount Olympus only had a value of 6. Katie says her first instinct was to say "You can't play that card because 6 is smaller than 10." After all, Jose was six years old and had never heard of negative numbers. But instead, Katie asked him a question: "What number do you think Mount Olympus will be?" Jose thought for a moment. "It's a number below zero"
Katie said "Yes, and the word for that type of number is 'negative.'" Jose paused again. "Then it's negative four." See that? A kindergartner started reasoning about negative numbers, a concept he won't encounter formally in math class for six more years. All because Katie asked "What do you think?" Katie admitted to me that she began to see Jose differently after this moment, to see him more fully as a child with mathematical ideas. My hope is that by playing games with your child and asking them similar questions, you will begin to see your own kids as mathematical as well. Thanks again to Katie. If you have your own favorite game you'd like to share, let me know by responding directly to this email! Sign up to get our weekly game recommendation, delivered straight to your inbox!